So now that I showed you all how to use a Go! baby cutter I think it is high time that I give one away, huh? Thanks to Accuquilt I have one to giveaway to you all along with 3 dies of your choice. Just leave a comment on this post to enter. I will leave the giveaway open for a week, until Monday August 15. Goodluck! I would love the apple core die along with the hexagons and circle - all those pieces that are hard to cut just perfect! I would love the hexagon and the triangle. What a great giveaway! Thank you for thinking of us your followers. I would love one of these! I'm in a hexagon making frenzy and it would make them so much easier! What a fantastic giveaway! 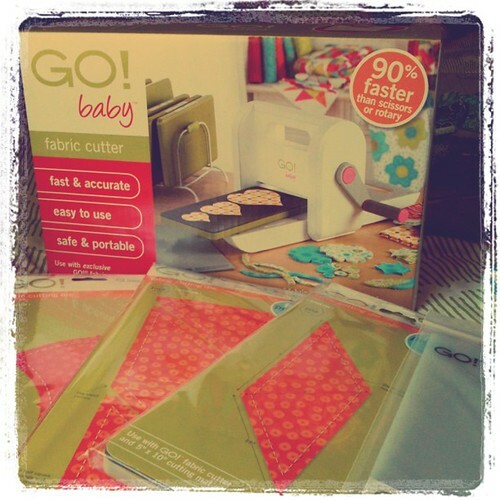 I've had my eye on the Go Baby cutter from a while now. I would love to win one! I would love to try one of these; i have heard so much about it. Would really like the hexagon, 2 1/2" strip cutter and diamond 4x4. Thanks for entering me! Great giveaway! This is the only way I would ever make hexies! What a great giveaway! August 15 just happens to be my birthday. Am I the last person on earth that doesn't have one of these very cool tools? Would love one! Thanks for the chance! I think I've tried to win one of these on just about every blog offering a chance. Oh this would be a dream to win one of these. I would have to think long and hard on which dies to get. I know I would love to have a strip die since I seem to cut allot of strips. Thanks so much for the chance. I'd love to be entered! My 3 dies I'd love would be the 2.5" strip, the 3.5" tumbler and the Rose of Sharon. 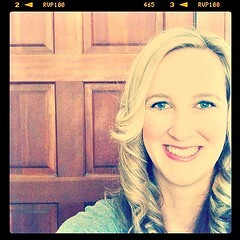 Pick me random generator :o) Love your blog! Thanks for the chance to win one of those awesome Accuquilt fabric cutters!!! Thanks for the great giveaway! I'd love to have the apple core, 3.5" x 6.5" rectangle and the circle and flower rag dies. Hope I win!!! I would love to win one of these! Thanks so much for the chance! I would love to win one - and I would get the hexie dies first and foremost! Thanks to you and Accuquilt for the chance! Thank you for the chance to win. I would love to have this! wow! hope i win this one - i've entered far too many of these already with no luck. thanks for the giveaway! Oooh, this is awesome. Thanks for the chance! Ooh I so want one of these and I can't afford one! I want the gingham dog die, the 2.5" strip cutter, and a little square...maybe the 2" square. Wow, so cool! This would be just the push I need to try some of the gorgeous shape patterns I've been seeing lately! What a great tool for any quilter!! I love the apple core die! I have been looking at one of these machines, and have been wondering if the dies can be also used in other die cutting machines (ie the sizzix big shot). Thanks for hosting the giveaway. It looks fun to use. I like that it quickly and accurately does the shapes, especially those that are hard to cut out. This would be the perfect tool to help me expand my quilt compositions. We're moving in a couple of months, and I'm itching to make some quilts for our new home. Thanks for the opportunity. I can't wait to try one of these puppies out! Thanks for the awesome giveaway Darci! I would love to have this. It seems like it would make appliqué so much easier. Thanks for the chance! These Baby Go machines are too cute. Loved how easy it was to cut the apple core. Thanks for the giveaway. I would love the 2 and a half inch strip, the five inch square, and a surprise! Love all the things you can make with these. I would love to have a GO! baby with apple core, triangles and hexagons. Thanks for the give away. I never win these things but I won't definitely without trying. Crossing my fingers and hoping! I would love to win and I really enjoy your blog and all the inspiration you share :). 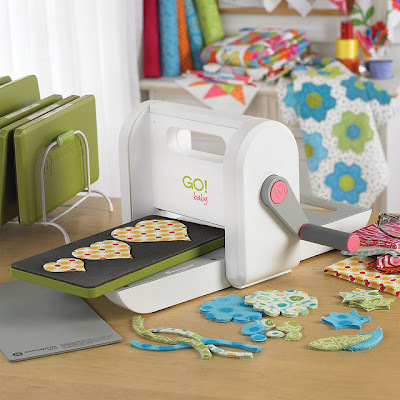 I would love to have a gobaby hanging around my sewing area! Thanks for the chance to win! Wow...super cool this Gobaby!!! i whis to have it! Love the GoBaby and would love to own one!!! Wonderful give away. They look so much fun!!! Am I the only one in the whole world who doesn't own one of these??? I'm not fussy- I'll take any dies I can get! Thanks for such a great giveaway! Love your blog. Please pick me!!! Would love to win this! I've been wanting one of these! Thanks for the giveaway! I would love to have one of these in my sewing room! Thanks for the giveaway!! I keep saying that "I don't really need one of these machines" - the problem is, I really want one!! With the limited sewing time that I have, I would be thrilled with the time savings! This would be a real time saver - not to mention make my cutting more accurate! Great Giveaway! I have seen this little cutie all over the place and I would love to win one :) The hard part is choosing the Dies. Maybe the Diamond, Tumbler, 2" square, Hexie and the Triangles are all on my wish list. So I keep thinking one of these times I'm going to win. I really hope I'm right. I agree with others choosing which dies is the hardest part. I like the tumblers, 1/2 square triangle and maybe a 2" square. Oh I sew want one of these!! Puhleeze!!! Great giveaway!! I would love to give this a try!! Oh baby, this baby would like to win a Go Baby! I've seen them used on so many of the quilting blogs. I would love to own one. Thanks for the opportunity to win one! Wow! I totally want one of these - thanks for the chance!! Thank you and Thank Accuquilt! Sounds like fun to try the Go! That little guy wants to come live with me! I love the hexagons and the quilt you made for Penelope's room. Too cute! I just love how much you can do with the Go! Baby! Please pick me! :0) Thanks for sharing! Would love the chance to win! Thank you! I have had my eye on one of these for a while now. I love the apple core die, the die that looks like tear drops and the circles. I guess all bases would be covered by that. FUN !! I love the colors on your blog. Thank you for this opportunity. Cool! I love that they have free quilt patterns if you sign up for their newsletter. This thing looks awesome. I'd love to make a tumbler quilt and skirt! Gosh I would love to win one of these little cutters! Thanks for the lovely giveaway! I would love to use one of these! The apple core is one of my favorite dies, and I have to say I'm a big fan of the hexagons as well! I would love to have one of these. Cutting is my least favorite part of sewing and craftting sometimes. Pick me pick me! Am dying for one of these! I enjoy your site. Thank you for the give-a-way. I would like the Go Daisy, Round Flower, and Funky Flower. The Sharon Pederson Flowers are also wonderful. ...love your new "look", and would love to own my own Go! Baby. Cutting perfect pieces is the worst part of quilting. Love you! I keep entering, and keep crossing my fingers! I want to make a tumbler and apple core quilt soooo bad! This would help greatly! My wrist would love me again. I would love to win this!!! heiditrejo(at)gmail(dot)com. I would love one of these! There are so many patterns that I would never try because I wouldn't want to cut all the pieces. I'm just jumping onto the quilting bandwagon and this would be a lovely new toy to help me out! oooh I hope I'm the winner!! Hexagons and diamonds for sure! I'm a newbie quilter, so thanks so much for the chance to win!! i love cutting fabric! it would be amazing to own one of these cutters! thanks for mychance. This cutter looks like a real timesaver! Thank you having the giveaway. I would love to WIN! Thank you for the chance. I'd love to have a GO! and finally start making some drunkards path blocks. Thanks for the chance to win! Your tutorial made the applecores look so easy! I would love love love this Go Baby!!! Your blog is such a wonderful inspiration. The more I see these around, the more I think I need one! Thanks for the giveaway! Thanks for the opportunity! I would love to own one of these! Still hoping that I might win one of these. I'd love to do some fancy shapes, but I don't want to cut out all those apple cores by hand. Thanks for the chance. Sweet! Please count me in. Awesome! This would make me not so nervous to try more difficult designs! I'M SOO in love with the go cutter! I hope I win because I'd put it to use!!! Thanks for the Go Baby giveaway. I'd choose hexagons, circles & hearts. It's so nice to see all the cool uses for these, hope I win! Me and everyone eles will LOVE to win one! I am really a bad cutter so I might go with 2.5 strip, 4' square and triangle.. I have enjoyed seeing how to use the GO Baby here and now I want one!! I had sworn off buying any major new gadget but my will is gone! Thank you so much for the give away! I love the half square triangles and the hexagons, and the flowers and hearts!! And the apple core, love your wall hanging!!! The Circle die and the heart die. I also joined your blog .. it lovely. Awesome giveaway! This would make my least favorite part of making a quilt (the cutting) so much easier! I have so wanted one of these!! Here's hoping! Soon we will be moving into a new house with my very first craft room - it would be the perfect home for one of these babies! I really want one of these, but they're not available in Switzerland yet... so winning one would be wonderful! Thank you Darci for a chance to win a Go Baby Cutter. It would be wonderful. I love the color combos of all your projects. Thanks again and good luck to all! Awesome giveaway! Thanks for the chance! This has been on my wish list for some time - maybe my dreams will come true. Thanks for a chance to win. Would love to win one of these! Thanks for the chance! Oh! I have been lusting after this!! I have been trying to win one of these for months. I am your newest follower. Would love to win this - thanks for the great giveaway! Thank you so much for the opportunity! This would be sooooo helpful! awesome...i would love the hexagons, hearts and stars. thank you. Go! Baby. Jump into that nice, thick, brown wrapping paper and post over to my house! You know you want to live here! We would have so much fun playing together, making beautiful art! You can sleep in the beautiful new art room, a place of honor. See you soon, I can't wait! Oh! Hope against all hopes!! Thanks for the giveaway!! ooh, please please, pick me. It's my birthday and I really want a Go Baby!!! ooo! The quilts I could make! Would love to win this-- hexies would deff be on my list of dies! I have been wanting to use one of these but have not had the opportunity. Thanks for putting on a great contest! Apple Core, Hexi's and Baby pack. compassionate quilter at rocket mail dot com. Thank you and AccuQuilt for giving me a chance to win! I would LOVE one of these!!!!! I never win anything, but what the heck! I'm hoping to get one for Christmas, if not before, but this would make cutting so much more fun! Oh Baby Be Mine ... this time??? Thank you for the chance ... I would love the Value Pack with the HSTs, Hexagons & diamonds ... I just can't keep doing all this trimming! Wow! What an incredible giveaway! I love your apple core quilt. I've never attempted curved piecing before but having the pieces cut that easily might be just the right incentive. Thanks! I'd love to win one of these machines! :) Thanks for the chance! I think using one of these would be fantastic for doing appliques and different shapes. I would love to try to make an 'apple core' quilt (is that the technical term?). Thanks for giving us the chance to win one! The wheels are turning......so many projects I could make with this! After seeing your little apple core quilt, I am convinced I need this! I want one of these so bad! I would get triangles first, then probably apple cores. Thanks! Love, love, love - this little thing is so cool! Thanks for the giveaway! I am a new quilter and this looks like a lot of fun! Love the apple core quilt! And the cutter looks cool. I've just been catching up on your blog. I've been so out of touch lately!! Thanks for chance to win!! I would just love to win one of these and I keep trying. If I did the first 3 dies that i would want to have would be the drunkards path, the tumbler and the Hexis. What a cool little toy!! Thanks for the demo. I love the little notches on the cut outs- it would make for more perfect piecing. This baby might have to be on my christmas list! What a brilliant gadget! Would love to win! I'd like one! :) Looks like fun! Wow, I sure would love to win that one! Seems to be very easy to work with and fast. What an amazing give away! I would love to win one of these machines. Thanks for the chance. I DIE for this- seriously! This would be great to have! I would love to win one of these! Thanks so much for the chance. how fun would this be?! thank you! In the beginning I was hesitant to the go cutter to be honest. But I have seen used in so many ways by now that I have warmed up considerable :) there are so many things that would be easier and more precise with it. I never win anything (not kidding - never won a thing in my life) so the cutter it is on my wishing list for x-mas. But thanks for the opportunity. I have had my eye on one of these for a while! Thanks for hosting! I would love to use the hexagon, tumbler and apple core dies with this! Ohhhhh how I would love one of these! Thanks for the chance! I would love a Go Baby! Thanks for the chance! I would love one of these...thanks for the chance! How exciting it is to try to win this babe! Whoever takes it home is very fortunate. Thank you for the giveaway! I would love to have one! Everyone makes them look like fun! I so want to win an AccuQuilt GO! Baby, maybe this entry will do it! Always have hope. I am seeing this GO! baby everywhere in blogland. I believe it would help me overcome my fear of HSTs. I would love to have one of these for my very own. Thank you for the chance. These machines look like so much fun, and a great time saver. Thanks for the chance to win! Great giveaway!! Would love one! Like everyone else here, I'm longing to win one of these little goodies! It would make all those annoying to cut by hand shapes a breeze to cut. Circles, hexagons and drunkards path would be the work of a few minutes instead of hours. I think I have entered every giveaway there has been for one of these! Maybe this time...fingers crossed, toes crossed, etc.! Oh hope I win - dies would like are hexagon, circles, and value. So ... as if I need another distraction? Like I can't confuse myself? If I win a go baby my hubby won't have to buy me one for Christmas ;) Thanks for the giveaway! I have been itching to try a hexagon quilt, this could just give me the extra push I need ! Thanks so much to you and Accuquilt for this giveaway! What a great giveaway! Good luck to us all. I'd love to give the Go! a try...fingers crossed! I will choose 2 1/2 strips, diamonds and value dies if I win. Love your blog! Thanks for sharing your lovely projects with us! This would be such a cool tool to have in the sewing room, not just for me, but to teach quilting to my daughters without letting them use rotary cutters!